Why aren’t candidates campaigning in casinos? Over the past week, Hillary Clinton and Barack Obama have appeared in the following Nevada locations: Two Mexican restaurants. The Sheet Metal Workers Union Hall. 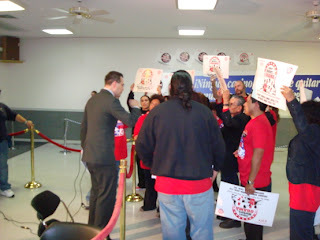 The Culinary Union Hall (twice). Two predominantly Hispanic neighborhoods. Two high schools and two junior high schools. Cashman Center. The Reno Events Center. A community center in Carson City. A church. Umm, what state is this again? Notice anything missing here? Now, compare and contrast. Suppose a hotly contested first-in-the-West primary with major potential consequences for deciding the nominee of a major political party were happening in, say, Washington. Would not Clinton and Obama be showing up for hard-hat tours of Boeing or pocket-protector tours of Microsoft? I just got it on excellent authority that the Vogue-proclaimed First Lady of Vegas, Elaine Wynn, changed her party affiliation to Democratic recently and plans to caucus at the at-large precinct held inside the Wynn Las Vegas Resort on Saturday. That should be fun to watch, assuming that the courts decide tomorrow that the at-large precincts stand! In this case, the Wynns live there so it really is their home precinct. Obama said he met Elaine after Mrs. Wynn bonded with Obama's wife, Michelle. Also, Mrs. Wynn, decked in a hot red dress, hosted a $1,000-a-head fundraiser in the Wynns' villa residence at the resort at about 10 pm Tuesday after the dullsville MSNBC debate and a post-debate rally. There were about 35 Nevada movers-and-shakers, including R&R Partners chief Billy Vassiliadis, developer Harvey Whittemore and lawyer Jim Jimmerson as well as State Sen. Steven Horsford and State Assemblyman Kelvin Atkinson. Steve Wynn -- and his ubiquitous dogs -- were nowhere to be found. Wynn himself remains a Republican. 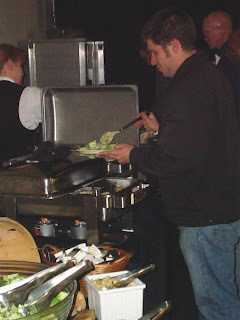 Also, Obama entered the private VIP entrance and didn't go anywhere near the casino. Of course. Because casinos are candidate Kryptonite. Look for my Las Vegas Weekly column on that tomorrow. THE STRIP IS LIVE - TONIGHT!!! Apologies again to Project Runway fans, but we're doing our LIVE show tonight at 7 pm PT at LVRocks.Com. Come on down to the chat. Our guest is the always-animated Las Vegas Mayor Oscar Goodman! Join us! Or wait till tomorrow to grab the podcast. Your choice. We love you either way. Well, it's out! Here's my business-section cover story for today's USA Today on Sheldon Adelson based on my two-hour conversation with him last week. There's more coverage to come, a travel piece accompanying a Friday photo spread. Can you tell I think the opening of the first new Strip resort in three years is a big deal? Read it here. This was a generously long piece by USA Today's standards, although I had enough great material to go much longer. I'm working on being able to play some of the audio on the show next week. We'll see. Some of it has already been posted on USA Today's website, so I'll at least be able to use that material. Live From The MSNBC Democratic Debate! I know you're not interested in a play-by-play on the debate, which better sources than I can and wish to provide. 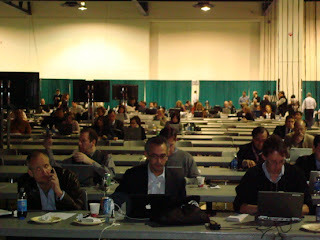 But I figured you'd like to see what it looks like from the media's point of view. Here we are all scattered in an enormous, very echoy exhibition space at Cashman Center watching flat screen TVs all over the place. 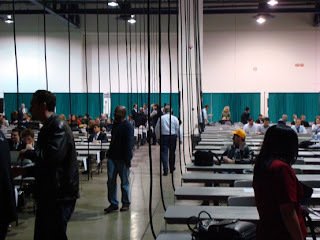 The candidates are debating in another room similar to this, but I'm not real sure where that is. Anyhow, the stars have descended on Vegas. 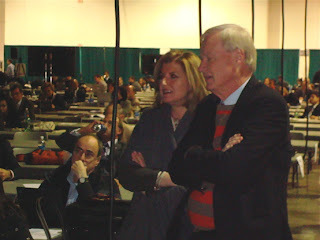 Here's the shameless blowhard Chris Matthews of MSNBC with the brilliant and rocking Arianna Huffington of the Huffington Post. Sorry everyone, the live version of "The Strip" is definitely not tonight. We'll keep you updated. Probably will be Wed night, but it might be Thursday. You're forgiven if you're annoyed with us for the uncertainty and don't want to bother this week, but the Mayor Goodman chat is really well worth it! It's just that this campaign is unpredictable and we're doing the best we can. 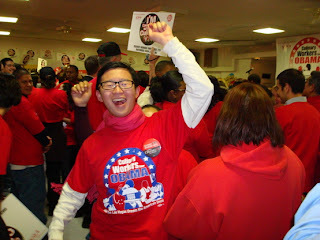 If you miss me, though, check out my Newsweek piece on the campaign posted here. Somehow I knew they'd use that headline. Also, keep your eyes peeled here for the link to my business-section cover story in tomorrow's USA Today on Sheldon Adelson and the Palazzo. ...if you got one of these Huckabee push-polls. 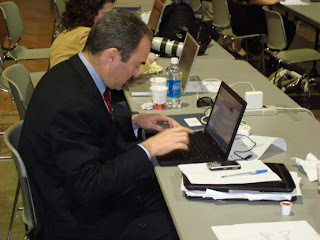 Paul Harasim is an excellent reporter over there and wants to chat. E-mail him at pharasim@reviewjournal.com or call the newsroom at 702/383-0264. He's on deadline today, so get cracking and call or write him by, probably, 3 p.m. PT. Nevada residents only. Just got word that a judge has denied the request by Tamares Group, the owners of the Plaza in downtown Las Vegas, to stop the Elad Group, owners of the planned Plaza resort on the Strip, from using the Plaza name in advance of a trademark trial. That is, Elad is free to use the name from now until at least July, when the judge will hear the case. Unless, of course, the parties find a way to resolve it out of court. In related news, Oscar Goodman told me in the interview that will air on this week's Strip that he'd like it to be resolved by default, meaning that the Tamares folks implode the old digs and build something new that works as a transitional property from the old downtown and Fremont Street west to the Union Park development that will include the $150 million performing arts center and other revitalization stuff. The folks at TalkingPointsMemo.Com have been carefully tracking this story. Check out this link to learn more. I'm overwhelmed today with work, won't be able to post much. But we've got a terrific chat with Mayor Oscar Goodman coming up on this week's show, which is likely to be live on WEDNESDAY because the Democrats are debating tomorrow night in Vegas. Stay tuned. So I'm minding my own business trying to finish up a major USA Today piece on something unrelated to the election and the home phone rings. And it never rings on Sunday evenings unless my partner needs me and I'm ignoring my cell, but in this news environment my cell is glued to my hip. It was an automated voice asking me if I was voting in the Jan. 19th GOP caucus in Nevada. 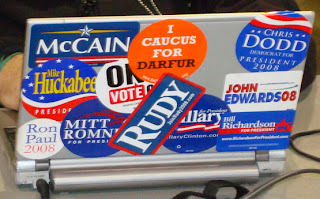 Of course, I'm not voting in any Nevada caucuses; I'm covering them. But I wanted to hear what came next, so I said yes. 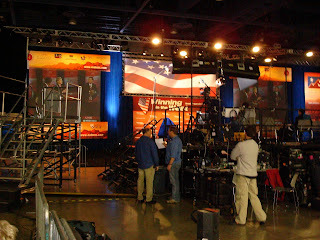 The voice then asked which of the four candidates, Huckabee, McCain, Romney or Guiliani, I supported. For the hell of it, I said Guiliani. Then came a series of stilted questions. I'm going on memory here, but I believe the first one asked if, knowing that Guiliani is pro-homosexual marriage and that Huckabee recently renewed his vows on Valentine's Day (I think), do I still support Guiliani? Then the voice noted Guiliani's support of "sanctuary cities" and immigration reform and so, knowing this, now don't I support Huckabee? Next I'm asked if I supported some "gun ban" and asked if, knowing that Huckabee is a lifelong hunter who opposes a gun-control law that Clinton signed and Guiliani supported, don't I support Huckabee now? After it got done shilling for the Huckster, the voice asked if I had a favorable view of Harry Reid. After I answered, the voice says something to the effect of what I think of the fact that Reid wants to surrender in Iraq and hand over our freedoms to Islamo-fascists. That's almost a quote. The voice concluded by asking if I were male (yup) and if I were over 50 (nope). Then the voice stated it was from a group called Common Sense Issues and was not affiliated with any campaign. Coulda fooled me! What's odd about this is that (a) until this there has been absolutely no campaigning of any sort by Republicans since Iowa and New Hampshire in Nevada and no appearances by any of the GOP candidates in at least a month, and (b) Huckabee has been openly hostile to gaming in a way that makes it hard to imagine he cares about or thinks he has much of a chance in this state. And we thought the Obama-Clinton thing was our only thrill this week. Looks like someone thinks Nevada's GOP caucus is worth slinging some mud over, too. 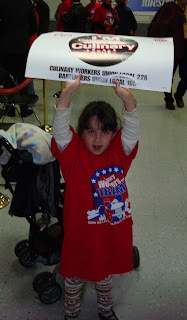 Following Friday's Obama rally at the Culinary Workers Union Local 226 Hall in Las Vegas, I was asked to wait for about a half-hour for an interview I needed with the union leader for some election coverage I'm working on including this piece for the New York Times. 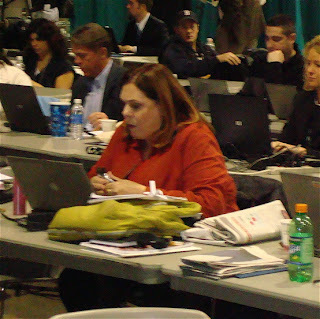 So I sat eating Skittles in the press area of the now-empty hall where hundreds of union workers had given Sen. Barack Obama a rousing welcome earlier. Then I started noticing something odd happening. 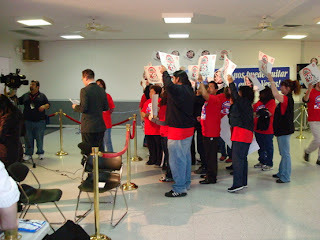 A reporter for the Spanish-language Univision station, KINC Channel 15, was doing a bit of his own union organizing. 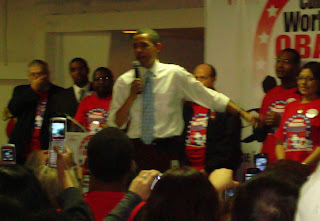 He corralled about two dozen union members clad in red Obama T-shirts to crowd around him as he did his live stand-ups for the 6 p.m. news. 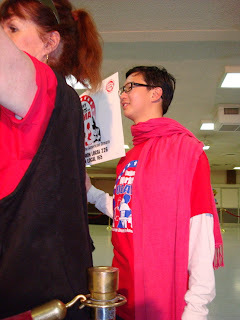 I don't speak Spanish, but it was obvious that he also instructed folks to go get placards and egged them on to cheer and chant for Obama en Espanol when he was on the air. And this is him on the air, before what to viewers at home must have looked like a wild, enthusiastic and large crowd, a la those shots of crazy sports fans outside the stadium after the big game. Although TV news folks do things we print people never can, I still thought this was fishy -- and a local ABC reporter also doing a stand-up in the same area seemed visibly annoyed by the whole thing and all the manufactured noise going on behind her. I was right: My own partner, the local NBC executive producer, confirmed that faking a rally for a political candidate in the middle of a hotly contested race (well, anytime) is a serious no-no.